Most of the time, I run Emacs in a single, maximized frame (and, sometimes, just inside a urxvt terminal). Inside that frame i create and destroy windows as needed to contain my buffers . After a while working with Emacs one gets used to a fluid window setup, where windows come and go as need arises. But I remember that in the early days I felt a bit confused: I started by creating a windows setup (split horizontally, then vertically, open files in each of the windows… that kind of thing) and was non-plussed when any operation (going to a Gnus buffer and reading messages, for instance) destroyed my carefully prepared layout. Over the years i’ve seen many a newbie feeling that way. My advice is usually to let go, and learn how to move around your windows, creating them as needed. That said, i must admit that, sometimes, i want to recover a certain window configuration in a quick way. 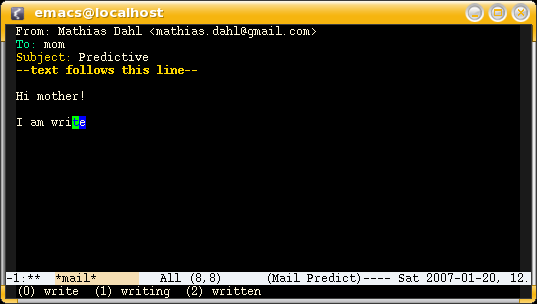 A particularly simple one is provided by winner-mode, a package which is part of Emacs. Winner keeps track of your window configurations, and provides functions to navigate your window configuration history. in your .emacs. Use Emacs normally, and whenever one cherished window layout gets destroyed, press C-c <left> (where <left> refers to the left cursor key) to recover it–actually, this calls winner-undo, and you can invoke it as many times as you want to visit previous window configurations. As one would expect, C-c <right> (the default binding for winner-redo) navigates configurations in the opposite direction . Simple and very useful, as it should be. But maybe you want to be automatically tele-transported to a previous configuration without traversing the intermediate ones. No problem: Emacs provides functions to store and retrieve window configurations (which, in fact, are the ones winner-mode is using under the covers). You can store the current window configuration in register ‘a’ (registers are named using single letters or numbers) pressing C-x r w a, and restore it later by means of C-x r j a. Again, it’s that easy. Although there exist several packages providing more sophisticated window management (named configs, save and restore, etc. ), in my experience, the simple tricks described above are more than enough (and work out of the box in any Emacs). As always, YMMV. For those of you not familiar with Emacs lingo, an Emacs frame is what most window managers would call a window, while an Emacs window is any of the regions displaying a buffer inside a frame. Usual ways of creating windows in Emacs are C-x 2, C-x 3, C-x 4 f, and so on. See Windows and WindowsAndFrames for more. In Emacs 21, the default keybindings start with C-x instead of C-c.
imenu is a very handy command i learnt not long ago. Just type M-x imenu in a source code buffer (an Elisp one, for instance) and start typing the name of a variable or function (or simply TAB for name completion). There you go: instant access to definitions in the buffer. You can read more about imenu (which has obsoleted speedbar in my workflow) in the Emacs Wiki, including how to adapt it to your favorite language (if it’s not yet supported). (otherwise, you’ll get an error about imenu-progress-message being an invalid function). "Copy current line in the kill ring"
Assign the new function to a handy shortcut, and you’re done. These functions have the additional benefit of leaving the point untouched. where, as you can see, i’m limiting the advice to some modes: just delete the major-mode check if you want it to work everywhere. Yes, I could type C-x ( to start the macro and C-x ) to end the macro and C-x e to execute the macro, but that requires that my fingers be more nimble than they really are. Particularly because ( and ) are shifted keys. This way I can start a macro with a single button push, finish it with another, and then repetitively run it by pressing a third button over and over. As it happens, Emacs 22 comes with the functionality Marc assigns to his F12 key built-in: press just e right after executing the macro the first time, as many times as you need. There’s also the possibility of using a numerical prefix to specify how many times the macro should be executed (as in M-10 C-x e to execute it ten times), and passing zero as the prefix will keep on (re)executing it until the end of the buffer is reached. One can also achieve macro re-plays with the command repeat, bound by default to C-x z. repeat works quite a bit like Vim’s ‘.’: it, well, repeats the most recently executed command, and keeps repeating if you keep pressing z. So, instead of C-x e e e e e ..., one can C-x e C-z z z z.... Not as convenient, but this works in Emacs 21, and, besides, repeat is an interesting command on its own. Note how you’re not limited to a single buffer, and how we use generic operations (like searching for next space to kill and yank the function’s return type). It’s also important to left the cursor in the right position for the next execution of the macro. At first you’ll make little mistakes, but fear not: you can actually edit the last recorded macro with kmacro-edit-lossage (Emacs 22 only). Just type C-xC-kl and you’ll be teletransported to a *Edit macro* buffer where you can edit your last keystrokes and record them as needed. Nifty, no? As you get used to macros, you’ll surely discover many other tricks, but you can speed up your learning by means of the excellent pages KeyboardMacros and KeyboardMacrosTricks in the Emacs wiki. (One of my favourite tricks is using Elisp in macros to dynamically change what gets inserted). This Linux Journal article by Jesper Pedersen is also a good way to get you started as a power macro user.